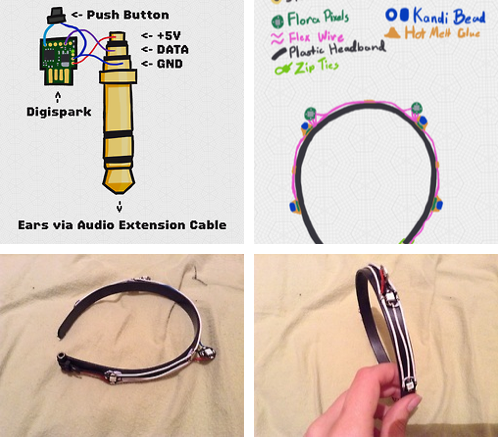 Glowing Fox Ears #WearableWednesday « Adafruit Industries – Makers, hackers, artists, designers and engineers! I remade my fox ears for Neko Nation yesterday and put heaps of LEDs in them! They can do rainbows! Laithorn asked if I’d put up schematics for my LED fox ears. Here goes! It’s a bunch of Adafruit Flora Pixels hot glued to a black plastic headband I found in a dollar shop. I wired them directly up to a Digispark (tiny arduino thing) which is powered from a 9v battery in my pocket. Flora Pixels need only one data wire, so you can power them through regular stereo audio cables which are strong, plentiful, comfortable and asthetic, and you can use audio splitters to hook multiple things up in parallel. 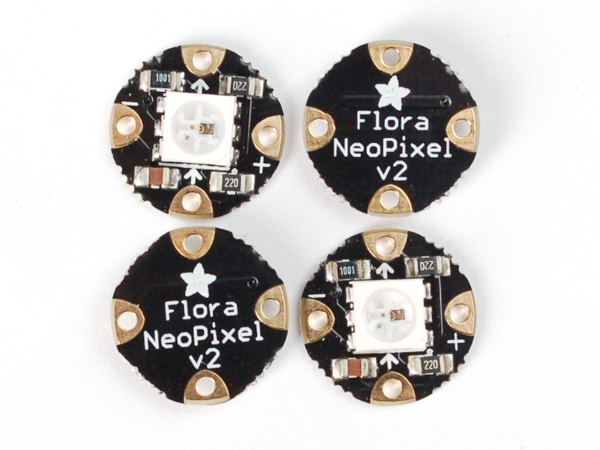 Flora RGB Smart Neo Pixel version 2 – Pack of 4 – What’s a wearable project without LEDs? Our favorite part of the Flora platform is these tiny smart pixels. Designed specifically for wearables, these updated Flora NeoPixels have ultra-cool technology: these ultra-bright LEDs have a constant-current driver cooked right into the LED package! The pixels are chainable – so you only need 1 pin/wire to control as many LEDs as you like. They’re easy to sew, and the chainable design means no crossed threads.